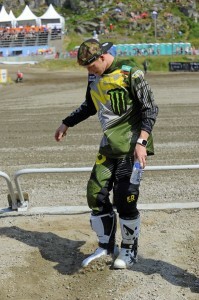 Two weeks after his first Grand Prix podium of the season and seven days after yet another victory in the 2015 Maxxis British Championship, Monster Energy Dixon Racing Team Kawasaki’s Max Anstie moved up to 7th in the World despite only bagging a 7th place finish in moto 2 at round eleven of MXGP in Sweden. Uddevalla was simplistic in terms of layout and technical challenges but the ruts and sharp bumps that emerged throughout the day reduce speed and help riders make a difference on the track where lap-times had been very close and similar on Saturday. The course lacked preparation and this was highlighted by the excellent weather conditions that gave the track a dry, dusty and ‘concrete’ feeling. Excessive – and frankly stupid – watering increased the risk significantly. 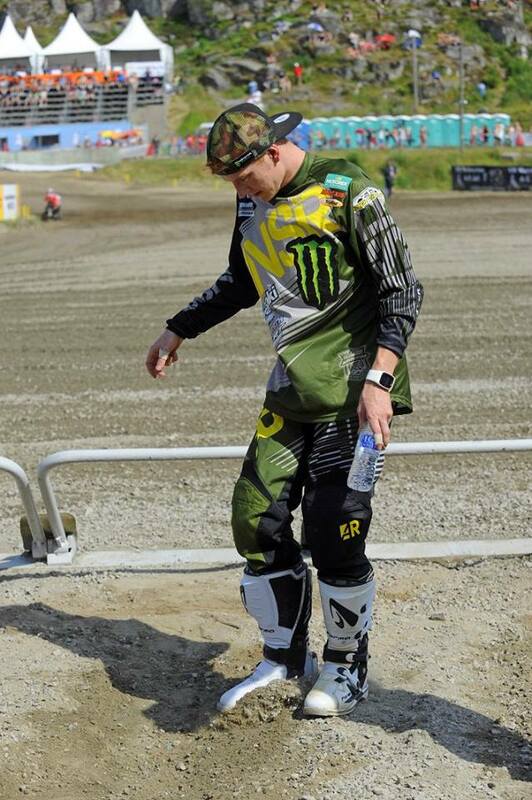 In this environment and watched by 22,00 spectators, Anstie knew he needed to be lively away from the start gate for any designs on another podium celebration. Setting off from sixth position after the Qualification Heat on Saturday – where he had made some impressive time and ground – the Brit took a decent jump out of the gate but lost some of the advantage in the first turn. After a crash Max ended up pitting for goggles, some 38 second behind the pack, later Max retired 5 laps from the end with a small misfire. In the second moto Max worked his way from fourteenth to seventh in what was otherwise a sound display of overtaking and persistence. Sitting seventh in the championship Anstie fortunately lost little margin to world champion Jordi Tixier in sixth as his brand-mate had to withdraw from the first moto with a broken exhaust. The team’s hectic schedule of national and international dates continues abound and a trip across the Baltic sea will bring Monster Energy DRT to Kegums for the Grand Prix of Latvia next weekend. Steve Dixon : “Disappointing today Max got some good jumps out of the gate but in the first race he went down and then couldn’t see and later came in for goggles but this left him way to much time to make up. Second race Max came through well to 7th but whilst he was making the same lap times as the leaders there was too much gap to make up to further improve. There are so many crazy crashes at the moment sometimes it’s good to be away in one bit. We look forward to Latvia where the track should be safer.